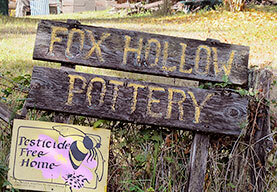 Artist-activist Lynn Bowers ’65 sculpts a life in clay. It’s a jungle in here. Monkeys bare their teeth. Panthers lurk in the corners. Bats hiss. But only one voice speaks. It’s the voice of Lynn Bowers, creator of the menacing menagerie. She describes the project that has consumed her Fox Hollow Studio in Eugene, Oregon, for two years: constructing masks and puppets for Mowgli, the ballet based on Rudyard Kipling’s Jungle Book by choreographer Toni Pimble, which premieres at the Eugene Ballet in April. Lynn has made masks, puppets, and costumes for ballet, opera, and theatre in Eugene for 30 years—everything from Die Fledermaus to Swan Lake. To prepare for Mowgli, she read Kipling’s stories and pored over images of Indian, Thai, and Balinese art. She chose decorative elements like metallic ribbon and acrylic gemstones. She mixed paint. Then she got out her clay and started shaping and sculpting animal faces. Her fired clay sculptures are used to make molds, from which papier-mâché or Zotefoam masks are formed. Blank surfaces come alive when Lynn applies her palette of brilliant colors. Eyes glow. Snouts protrude. 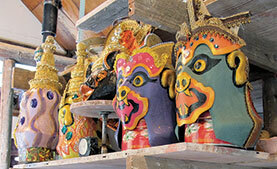 All of the masks are lightweight and durable, and, in a collection numbering in the hundreds, no two are decorated alike. Lynn used the Asiatic black bear as a sculptural model for Baloo, Kipling’s “sleepy brown bear,” and painted the resulting mask green. Baloo’s copper-colored eyes peer out beneath thick black brows. They observe, but never threaten. At the back of his head, and twice its size, is a shimmering circular headdress—glorious with its weave of red fabrics, golden threads, and tiny mirrors. Lynn learned calligraphic brush strokes in classes with Lloyd Reynolds [English & art, 1929–69]. Evidence of that association includes the serpentine leaf patterns that form the coats of wolves that adopt the human Mowgli, as well as italic letter form in signage everywhere in the studio. 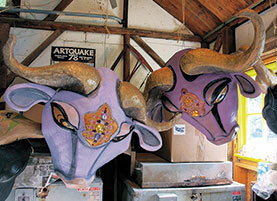 In addition to her work in the performing arts, Lynn has done public sculpture and residential and commercial mural painting, and she earned a grand prize for her “mad cow” suits featured in an Earth Day celebration in Eugene. The Eugene Weekly selected her as the best artist of 2004. 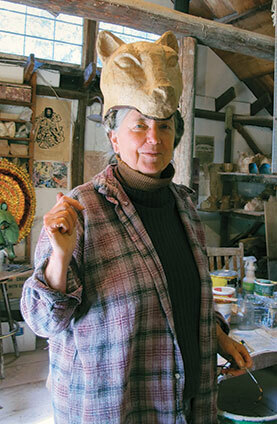 She also has put on limited exhibitions of her ceramics in Eugene, in Portland, and on the Oregon coast, including those with Lucinda Parker McCarthy ’66. For 40 years, most of Lynn’s work has been shown and sold directly from her residential studio, set on the edge of corporate industrial forestland. In the showroom, shelves built by her partner, Alan Foster, hold vases and pitchers, mugs and goblets, and plates and candlesticks, incised with her signature bold patterns. Lynn began working with clay early in life. She earned a degree in fine arts at Reed in the combined program with the Museum Art School (now the Pacific Northwest College of Art). “I loved Reed,” she says. For the first time in her life, she encountered “like-minded people” and felt at home. Reed also supported her inclination to pursue a self-directed and nontraditional career. At the museum school, she studied with Manuel Izquierdo, whose sculptures and prints are considered to be the most lyrical of his generation. And from 1962 until 1980, she attended summer workshops at the Pond Farm Workshop in northern California, where she studied with Marguerite Wildenhain, master potter from the Bauhaus and one of the century’s most influential teachers and artists. Marguerite urged Lynn to remember what moved her and to draw from it as a source of inspiration throughout her life. 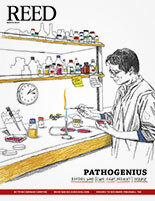 For the 2007 anthology Marguerite Wildenhain and the Bauhaus, Lynn wrote: “I first came to Pond Farm from Reed College, 19 years old, as agitated and ardent as most teenagers. The beauty, the quiet and the clay centered me.” She described the life lived by the hand as simple, dignified, and honorable. The craft she learned from Marguerite has helped her become, as Marguerite intended, one who is fully human. 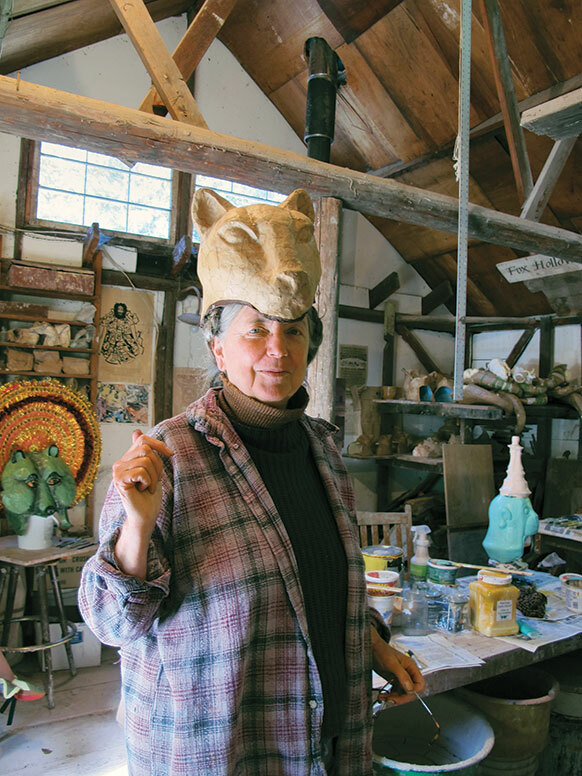 Although she could have been an artist without attending college, Lynn says, she relies on her Reed education in her work as an environmental activist—work that she has done in tandem with her art for 10 years. Her ability to write concisely and to evaluate evidence (Is it plausible? Is it true? Does the evidence actually support the assertion?) have helped her cut through the red tape and hype of herbicide spray practices being used for forest management in Oregon. As an organizer for Forestland Dwellers, her neighborhood nonprofit, she has made maps, documented statistics, written essays, given speeches, and held prayer circles at corporate timber offices. She was appointed to a county advisory committee examining vegetation management and has testified at the Oregon Board of Forestry on the inadequacy of forest practices rules. She also drew the Kid-Safe Coloring Book for Forestland Dwellers and the Northwest Center for Alternatives to Pesticides. The health of children and adults alike and the freedom to live in an uncompromised environment spur her efforts. Being an activist is less than a stone’s throw from Lynn’s work as an artist. Both occupations demonstrate her commitment to live simply and whole and to be a steward of the gifts she has been given: a keen eye, a sharp intellect, and a passion for things of the earth.